(Bloomberg) -- Senator Elizabeth Warren has asked Treasury Secretary Steven Mnuchin for details about an emergency phone call he made to financial regulators on Christmas Eve that spooked investors, triggering memories of a market liquidity crisis not seen since the financial crisis in 2008. In the final weeks of December, the S&P 500 was in the midst of a seven percent drop -- bringing equities to the brink of a bear market -- the U.S. government’s partial shutdown had started, and Bloomberg News had reported that President Donald Trump had discussed firing Federal Reserve Chairman Jerome Powell. The Fed had drawn the president’s ire after a hawkish statement signaling further rate hikes that roiled markets. The combination of events led to further chaos in financial markets, and Mnuchin stepped in with a tweet on Dec. 23: He had called the top six U.S. banking executives to confirm there was “ample liquidity” for lending purposes. Mnuchin also announced he had organized a call of the President’s Working Group, made up of the top regulators and traditionally only convened during moments of crisis, for the following morning. The trouble: Market participants were not worried about liquidity, but Mnuchin’s statement raised doubts and left investors wondering what might be lurking in the markets. The President’s Working Group, given the moniker “plunge protection team” by investors, was formed in the aftermath of the stock market crash of 1987. It has been summoned rarely -- and traditionally in times of crisis -- as a way for the Treasury chief to take the pulse of the investor community, and show the government is looking out for the health of the broader U.S. economy. The group includes representatives from the Federal Reserve Board, the Securities and Exchange Commission and the Commodity Futures Trading Commission. One of Mnuchin’s predecessors, Hank Paulson, who served during the George W. Bush administration, called a meeting of the group with the president in 2008 following the government’s bailout of Bear Stearns Cos. Paulson said at the time that he would “do what it takes” to calm markets. What made Mnuchin’s use of the Working Group for the Dec. 24 call even more unusual was the existence of the Financial Stability Oversight Council, a group of regulators formed after the 2007-2008 crisis designed to oversee the kind of market turbulence and liquidity issues about which he asked the Working Group. 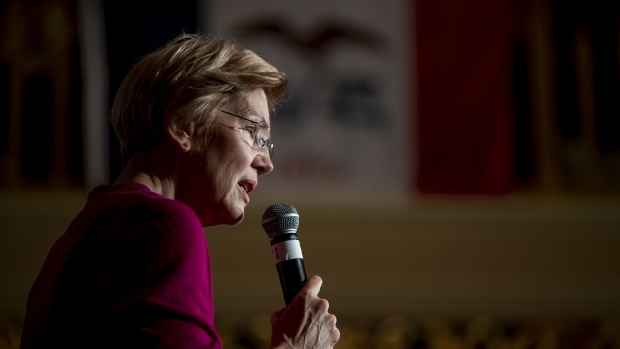 “Given the out-sized role of liquidity problems in the 2008 financial crisis, we would like to better understand the risks to the U.S. banking system that triggered your concerns and prompted this rare public statement,” Warren wrote in her letter. Warren, a member of the Senate Banking Committee, requested that Mnuchin explain what prompted him to call the banking executives and regulators in the first place, along with transcripts, summaries and documentations related to both calls. She also asked if Treasury has information about financial risks that could hurt the American economy. She gave Mnuchin a Jan. 28 deadline to respond to her request. Warren also sent letters to each of the six banking executives that Mnuchin called before Christmas, asking how events during the week of Dec. 17 affected liquidity, whether they see liquidity risks, and details about the call and actions taken after. She sent the letters to Jamie Dimon of JPMorgan Chase & Co., Mike Corbat from Citigroup Inc., Goldman Sachs & Co.’s David Solomon, James Gorman of Morgan Stanley, Tim Sloan of Wells Fargo & Co. and Brian Moynihan of Bank of America Corp.